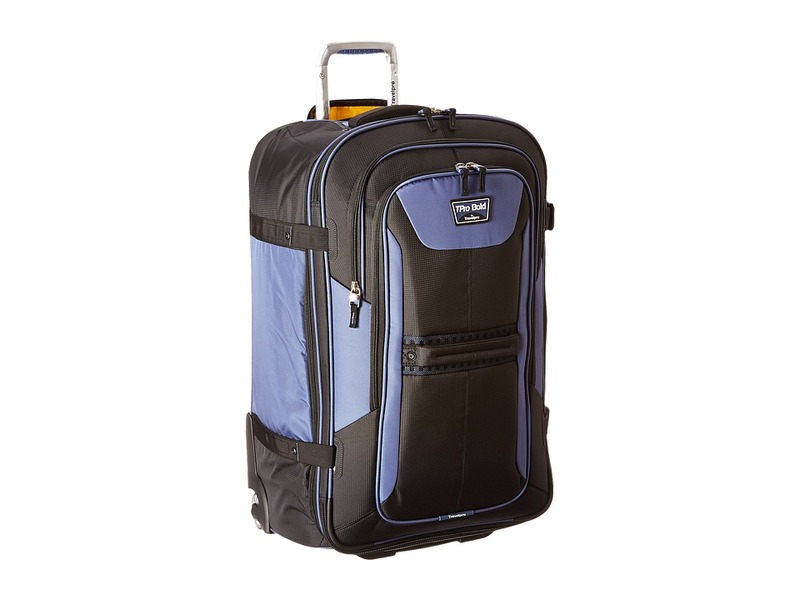 The 2.0 - 22 Expandable Rollaboard is part of the Travelpro TPro Bold Collection. Stay neat and organized as you travel the globe, with the TPro Bold 2.0 - 22 Expandable Rollaboard. Made with rugged high-density polyester fabric and a water repellent coating. Retractable, telescoping handle. Top and side padded handles for easy lifting. Front zip pocket for quick-access items such as phones, cords, and snacks. Padded pocket allows quick access to your tablet without opening the main compartment. Six exterior slip pockets. One exterior credit card slot. Hidden back pocket ideal for quick access to change, keys, electronic cables, phone and more. Interior opens book-style to reveal a mesh zip compartment and wet pocket. Three interior slip pockets. Interior adjustable compression straps with Duraflex buckles. Ball-bearing inline skate wheels creates a smooth ride on any surface. Imported. Measurements: Width: 15 in Depth: 9 in Height: 21 in Weight: 7 lbs 8 oz Proposition 65 WARNING: This product contains chemicals known to the State of California to cause cancer and birth defects or other reproductive harm. 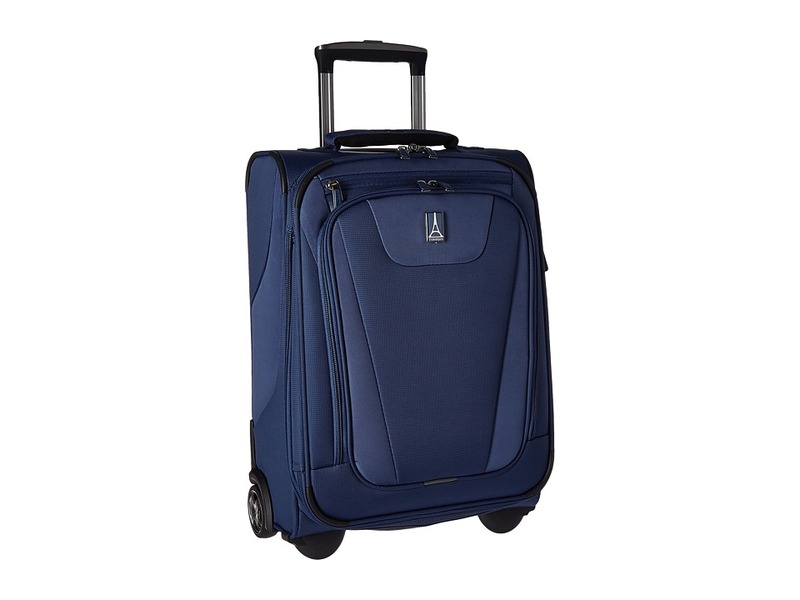 The 2.0 - 25 Expandable Rollaboard is part of the Travelpro TPro Bold Collection. Adventure is calling your name: make it happen with the ultralight TPro Bold 2.0 - 25 Expandable Rollaboard. Made with rugged high density polyester fabric. Features aircraft-grade telescoping handle. Adjustable Hold-Down Straps Front zippered pocket for easy access items. Expands an additional 2.5 inches for maximum storage. Spacious interior mesh pocket is built onto lid. Two gliding wheels offer easy portability. Imported. Measurements: Width: 17 in Depth: 9 in Height: 25 in Weight: 6 lbs 4.16 oz Proposition 65 WARNING: This product contains chemicals known to the State of California to cause cancer and birth defects or other reproductive harm. 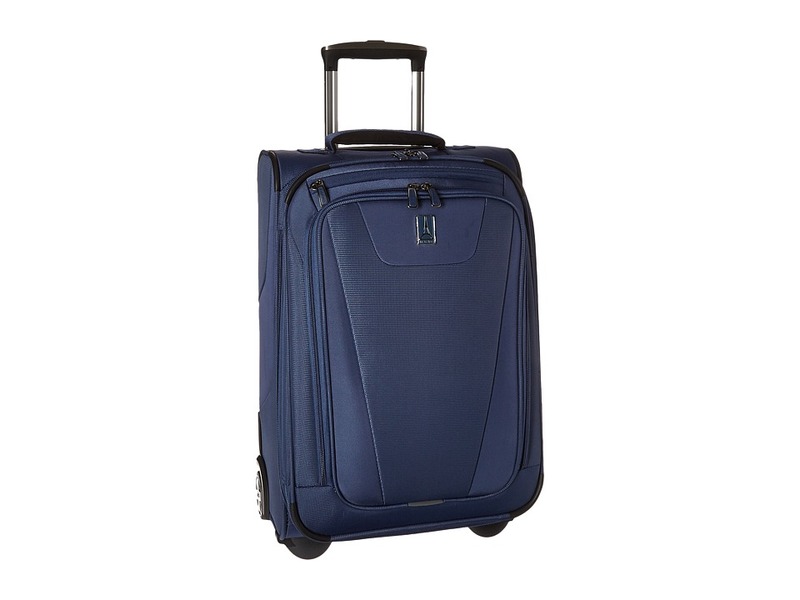 The 2.0 - 28 Expandable Rollaboard is part of the Travelpro TPro Bold Collection. Stay neat and organized as you travel the globe, with the TPro Bold 2.0 - 28 Expandable Rollaboard. Made with rugged high-density polyester fabric and a water repellent coating. Retractable, telescoping handle. Top and side padded handles for easy lifting. Front zip pocket for quick-access items such as phones, cords, and snacks. Padded pocket allows quick access to your tablet without opening the main compartment. Six exterior slip pockets. One exterior credit card slot. Hidden back pocket ideal for quick access to change, keys, electronic cables, phone and more. Interior opens book-style to reveal a mesh zip compartment and wet pocket. Three interior slip pockets. Interior adjustable compression straps with Duraflex buckles. Ball-bearing inline skate wheels creates a smooth ride on any surface. Measurements: Width: 18 in Depth: 13 in Height: 30 in Weight: 9 lbs 6.4 oz Proposition 65 WARNING: This product contains chemicals known to the State of California to cause cancer and birth defects or other reproductive harm. 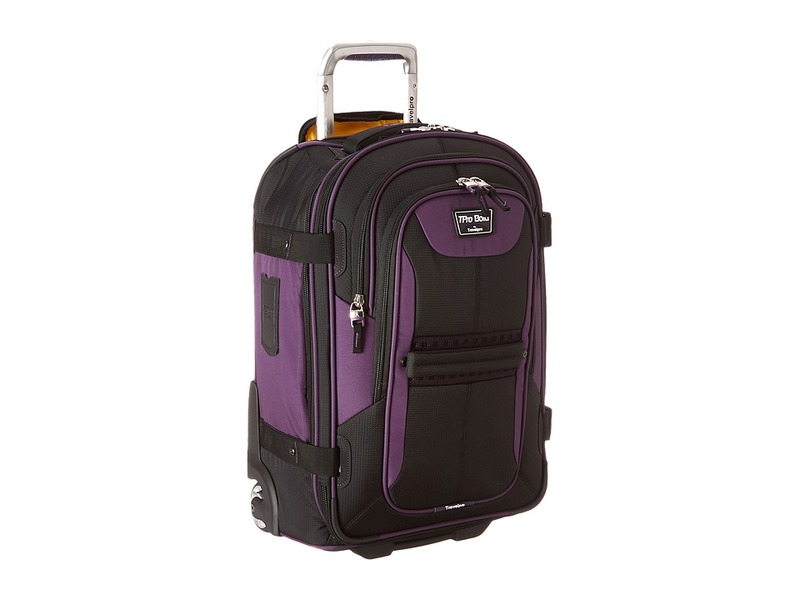 The perfect luggage for organization, this TPro Bold 2.0 21 Expandable Spinner has a compartment for all of your essentials. Made of high desity, rugged polyester fabric with water resistant coating. Durable zipper closure. Rubberized buckles on compression straps. Airline-grade aluminum handle locks in 2 positions. Neoprene cushioned carry handles. Front zippered pocket for easy access items. Interior lining made of polyester. Interior zipper pockets at top with mesh detail. Interior mesh zipper pocket with elastic compression straps. Features a polypropylene honeycomb construction frame and EVA foam for ultra light travel and durability. Four 360&amp#176 rotating spinner wheels offer easy portability with a unique bottom tray that aligns and stabilizes wheels for effortless maneuverability and enhanced durability. Imported. Measurements: Width: 14 in Depth: 9 in Height: 21 in Weight: 7 lbs 8 oz Proposition 65 WARNING: This product contains chemicals known to the State of California to cause cancer and birth defects or other reproductive harm. 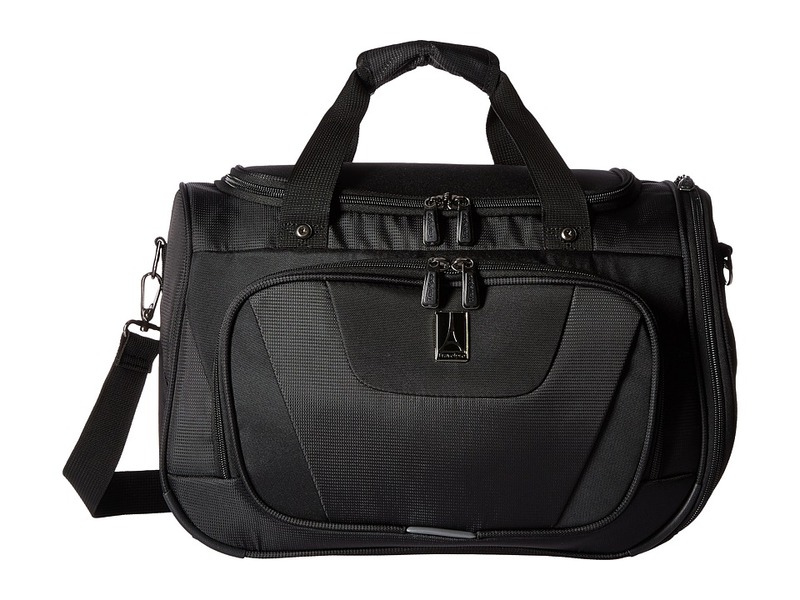 The Travelpro Maxlite Soft Tote is the perfect trip companion! Made of durable polyester fabric with water and stain resistant coating. Zip closure. Dual, padded top carry handles and an adjustable/removable padded crossbody strap. Ergonomic high-tensile-strength zipper pulls. Front zip pocket, perfect for boarding passes and loose items as well as a side zip compartment. Lined interior features one zip pocket. Imported. Measurements: Width: 17 1 2 in Depth: 8 in Height: 10 1 2 in Weight: 1 lb 12 oz Proposition 65 WARNING: This product contains chemicals known to the State of California to cause cancer and birth defects or other reproductive harm. Stress-free travel is the way to go: make it happen with the ultralight Maxlite 4 International Expandable Rollaboard by Travelpro. Made of nylon fabric with a coating to maintain water and stain resistance. Features a polypropylene honeycomb construction frame and EVA foam for ultra light travel and durability. Handle locks in 2 positions, 38 in and 42.5 in. Front zippered pocket for easy access items. Expands an additional two inches for maximum storage. Spacious interior provides a full length lid pocket, two zippered mesh compartments, and adjustable tie-down straps. Two gliding wheels offer easy portability. 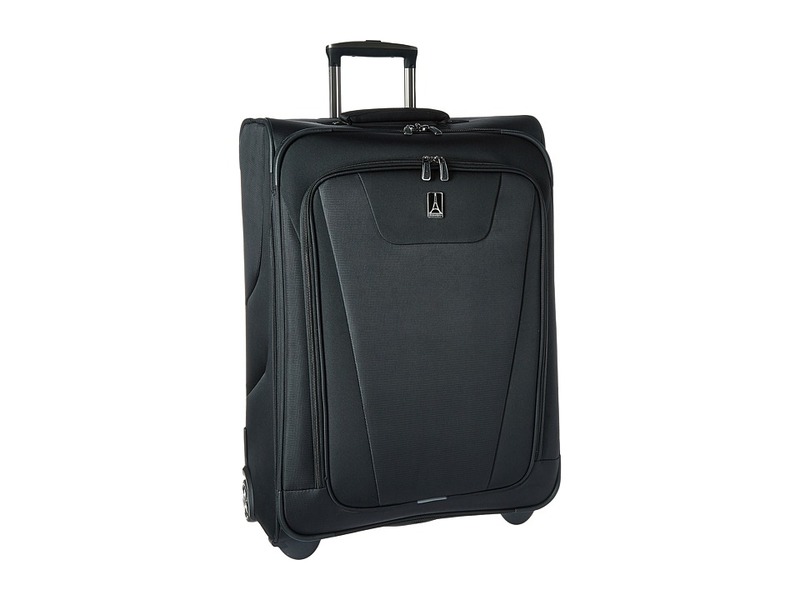 This case has a body measurement of 19.5 and an overall (wheels and handles) measurement of 22.5. Imported. Measurements: Width: 15 1 2 in Depth: 8 1 2 in Height: 22 1 2 in Weight: 5 lbs 9.6 oz Proposition 65 WARNING: This product contains chemicals known to the State of California to cause cancer and birth defects or other reproductive harm. Stress-free travel is the way to go: make it happen with the ultralight Maxlite 4 22 Expandable Rollaboard by Travelpro. Made of nylon fabric with a coating to maintain water and stain resistance. 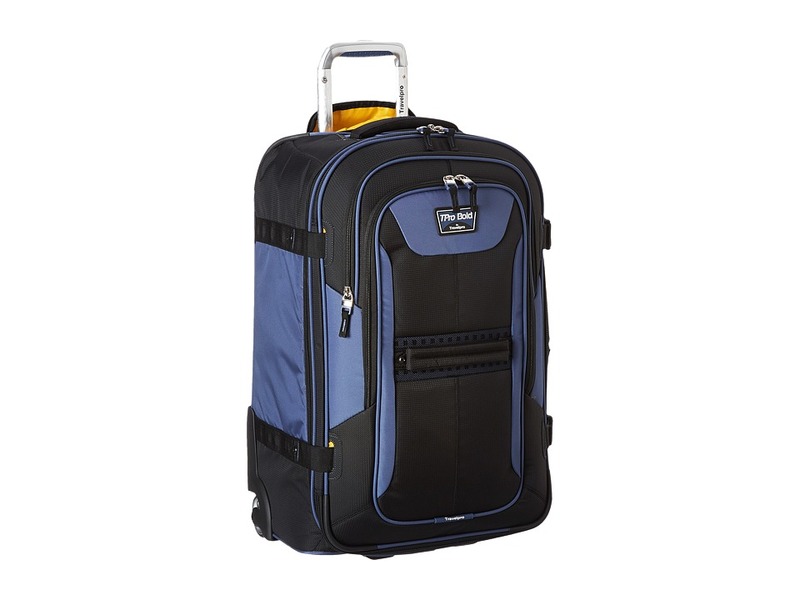 Features a polypropylene honeycomb construction frame and EVA foam for ultra light travel and durability. Handle locks in 2 positions, 38 in and 43 in. Front zippered pocket for easy access items. Expands an additional two inches for maximum storage. Spacious interior provides a full length lid pocket, a zippered mesh pocket, adjustable tie-down straps, a removable suiter for wrinkle-free packing and doubles as a packing board when detached. Two gliding wheels offer easy portability. Imported. Measurements: Width: 14 in Depth: 21 in Height: 9 in Weight: 6 lbs Proposition 65 WARNING: This product contains chemicals known to the State of California to cause cancer and birth defects or other reproductive harm. Stress-free travel is the way to go: make it happen with the ultralight Maxlite 3 26 Expandable Rollaboard by Travelpro. Made with water and stain resistant coated polyester fabric. Features extendable trolley handle as well as a padded top and bottom grab handle. Airline-grade aluminum handle locks in 2 positions, 38 in and 42.5 in. Front zippered pocket for easy access items. Expands an additional two inches for maximum storage. Spacious interior provides a full length lid pocket as well as a zippered mesh pocket and adjustable tie-down straps. Two gliding wheels offer easy portability. Imported. Measurements: Width: 18 1 2 in Depth: 11 in Height: 28 in Weight: 7 lbs 10 oz Proposition 65 WARNING: This product contains chemicals known to the State of California to cause cancer and birth defects or other reproductive harm. 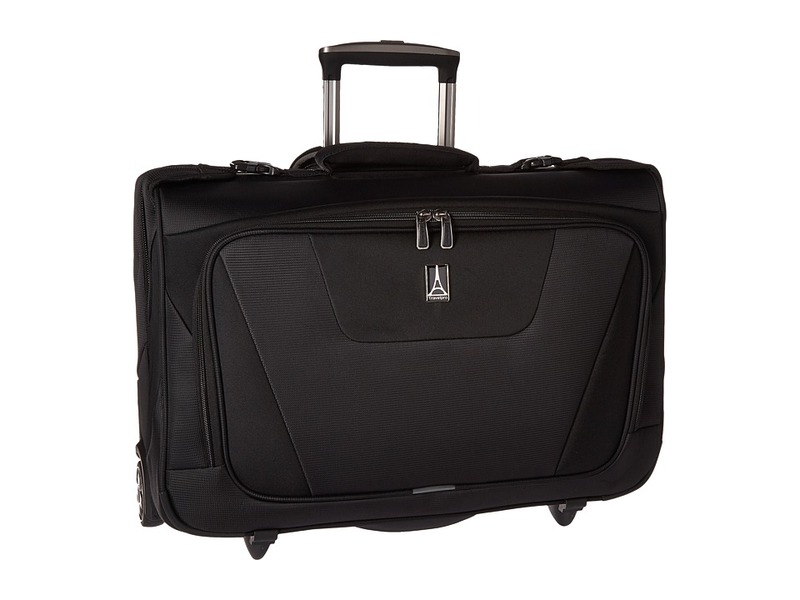 The Carry-On Rolling Garment Bag is part of the Travelpro&amp#174 Maxlite 4 Collection. Size requirements vary among airlines. Please check with your airline for carry-on luggage size restrictions. 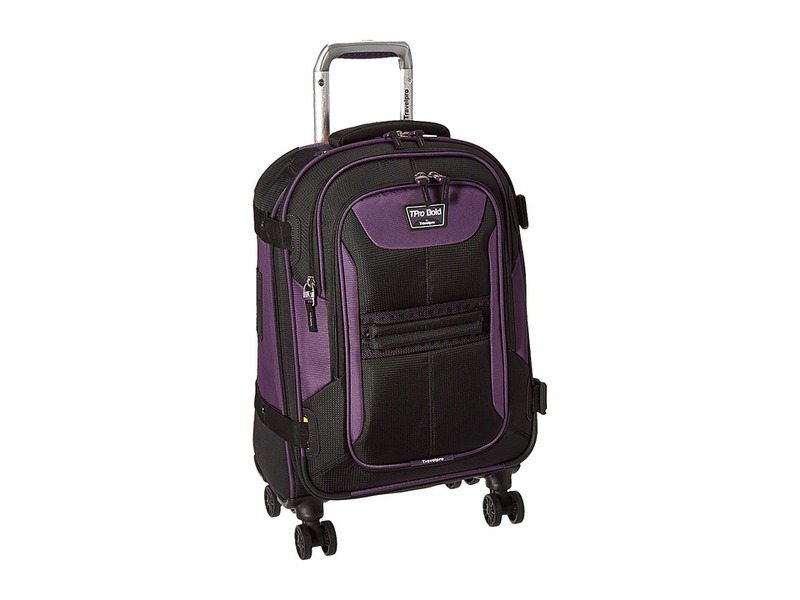 Get yourself and your wardrobe wherever you need to go in ease with the help of this Travelpro&amp#174 luggage. Durable nylon fabric is coated with Duraguard&amp#174 fabric protector. Airline quality aluminum handle system minimizes wobble when fully extended. Handle features contoured grip. Carry handle at top and bottom for easy lifting. Two front exterior pockets for accessories. Extra-wide interior with adjustable hold down straps to keep clothing in place. Removable suiter system garment bag to keep clothing crisp. Mesh interior pockets with zip closure and interior side pocket with zip closure. Two skid bars at bottom and back of bag protect from scuffing. Sealed, ball-bearing inline skate wheels. Measurements: Width: 21 1 2 in Depth: 9 in Height: 15 in Weight: 5 lbs 9.6 oz Proposition 65 WARNING: This product contains chemicals known to the State of California to cause cancer and birth defects or other reproductive harm.